We’d love your help. 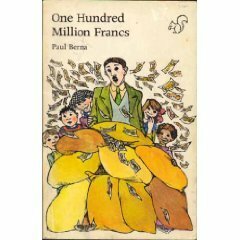 Let us know what’s wrong with this preview of A Hundred Million Francs by Paul Berna. Les enfants de la bande à Gaby ne possèdent qu'un trésor : un vieux cheval à roulettes qui leur permet de dévaler la rue dans de grands éclats de rire. Mais un trésor attire forcément des voleurs, ce qui entraînera les enfants dans une aventure plutôt cocasse ! To ask other readers questions about A Hundred Million Francs, please sign up. someone just recommended this book for my son, who loved Emil and the detectives. I see it's translated into english. Anyone recommend a particular translation or edition? 4.5 stars. A gang of French children have a favourite game. One of them owns what must be an old rocking horse or carousel horse that has been welded onto a chassis with three wheels. The horse having lost it's head does not lessen the children's enjoyment at all, they spend their days riding their horse down a steep road and avoiding traffic or not as the case may be. The children get caught up in solving a bank heist. There are some great characters, we loved Marian with her 60 or so faithful 4.5 stars. A gang of French children have a favourite game. One of them owns what must be an old rocking horse or carousel horse that has been welded onto a chassis with three wheels. The horse having lost it's head does not lessen the children's enjoyment at all, they spend their days riding their horse down a steep road and avoiding traffic or not as the case may be. The children get caught up in solving a bank heist. There are some great characters, we loved Marian with her 60 or so faithful dogs that she has rescued and re homed. The illustrations are wonderful, lots of great dog drawings. Their hideout sounded wonderful, we loved listening to their simple pleasures of sharing baked potatoes. In English, The Horse Without a Head is one of my top ten favorite books EVER. Ever. I must have read it about 40 times in English; this is the second time I've read it in French. Having read 3 or 4 novels en francais in the past year, I think it's fair to say that the prose here is the most difficult I've come across--full of slang and technical terms (the setting is brutally urban, a busy rail junction and industrial area in post world-war-two Parisian slums), and the plot is so darn full of t In English, The Horse Without a Head is one of my top ten favorite books EVER. Ever. I must have read it about 40 times in English; this is the second time I've read it in French. Having read 3 or 4 novels en francais in the past year, I think it's fair to say that the prose here is the most difficult I've come across--full of slang and technical terms (the setting is brutally urban, a busy rail junction and industrial area in post world-war-two Parisian slums), and the plot is so darn full of twists and turns that I STILL can't quite follow it. But the ten kids are WONDERFUL and the details are so incredibly evocative that you just skip over the bits you can't follow. Marion, la fille aux chiens, is my original hero--with her green eyes and man's jacket and sixty slavering dogs who obey her every whim--and the scenes of mayhem in the abandoned costume-and-gag factory are just... indescribable. The villains are evil, the heroes youthful and honorable, brave and destitute, and Gaby's gang even includes a couple of minority kids... this in a book written in 1955. I first read it at the age of 7 in a Book-of-the-Month club edition published in the US in 1958, translated by John Buchanan-Brown and grittily illustrated by Richard Kennedy. The same translation was published in the UK, but for the US edition they edited out all references to A) the kids smoking (!!!) and B) the grown-ups sharing an occasional glass of wine! Apart from that, the US edition is curiously more elegant and readable than its British counterpart, suggesting a better editor (despite its having been cleaned up for its 1950s American audience). I won't tell you the title of the British version, as it is a MASSIVE SPOILER for the denouement. WHYYYY??? Why would any editor do such a thing? Inspector Sinet took a good look at her. She was an odd sort of girl, not yet twelve and wretchedly poor, and yet there was something about her that made you think twice. She was worth having on your side. For STRONG FEMALE CHARACTERS, no one EVEN COMES CLOSE to Marion Fabert. You just can’t beat her. 1955, in too-short skirt and cut-down man’s jacket, gold fringe beneath a black beret — the gang’s treasurer, tough as nails, vet to every dog in Louvigny, with a dozen dog patients kept in cast-off Inspector Sinet took a good look at her. She was an odd sort of girl, not yet twelve and wretchedly poor, and yet there was something about her that made you think twice. She was worth having on your side. For STRONG FEMALE CHARACTERS, no one EVEN COMES CLOSE to Marion Fabert. You just can’t beat her. 1955, in too-short skirt and cut-down man’s jacket, gold fringe beneath a black beret — the gang’s treasurer, tough as nails, vet to every dog in Louvigny, with a dozen dog patients kept in cast-off rabbit hutches at the bottom of her despairing single parent’s garden. Marion is not the protagonist of this novel, but she is the heroine. She is the strongest, most memorable character in the book —an original, nobody’s sidekick, although she is Fernand’s best friend. The astonished men turned, and their hands hung useless and their jaws dropped to see the girl and her sixty silent, straining dogs standing behind them. The dogs were waiting as though they were held back only by some invisible leash. With a joyful bound the dogs fell to work. Я долго не могла взяться за эту книгу как следует, и виной всему первые страницы. Безнадежно грустные: дети бедняков играют с безголовой деревянной лошадкой на колесиках. И аннотация вдобавок обещала, что единственную радость у ребят скоро украдут – что совсем не способствовало желанию окунуться в чтение. Пофилонив три недели, я наконец снова принялась за книгу и прочитала буквально в один присест – благодаря маленьким героям, их родителям, инспектору Синэ и многострадальной лошадке, к которым я Я долго не могла взяться за эту книгу как следует, и виной всему первые страницы. Безнадежно грустные: дети бедняков играют с безголовой деревянной лошадкой на колесиках. И аннотация вдобавок обещала, что единственную радость у ребят скоро украдут – что совсем не способствовало желанию окунуться в чтение. Пофилонив три недели, я наконец снова принялась за книгу и прочитала буквально в один присест – благодаря маленьким героям, их родителям, инспектору Синэ и многострадальной лошадке, к которым я привязалась с тем самых первых страниц, которые ранее вызывали у меня ступор. Отличная книга. Я прикипела к ней всем сердцем, хотя ожидания были не самые радужные. Отдельное спасибо волшебной Марион с ее верными четвероногими друзьями, сероглазой умнице и благодетельнице, которая грела душу даже в самой (казалось бы) безвыходной ситуации. Vaeses prantsuse agulis elavate lastekamba jaoks on oluline vaid üks ja ainus mänguasi - vana peata hobune, millega saab täiskiirusel mööda tänavaid alla kihutada. Äkitselt hakkavad igasugu kahtlased tegelased nende hobuse vastu huvi tundma ning soovivad seda suure summa eest ära osta. Lapsed pole nõus oma mänguasjast loobuma ning ühel päeval hobune varastatakse. Politsei ei võta kadunud hobuse juhtumit tõsiselt ja nii ei jää lastel muud üle kui uurimine enda kätte võtta. Lõpuks on loosse segatu Vaeses prantsuse agulis elavate lastekamba jaoks on oluline vaid üks ja ainus mänguasi - vana peata hobune, millega saab täiskiirusel mööda tänavaid alla kihutada. Äkitselt hakkavad igasugu kahtlased tegelased nende hobuse vastu huvi tundma ning soovivad seda suure summa eest ära osta. Lapsed pole nõus oma mänguasjast loobuma ning ühel päeval hobune varastatakse. Politsei ei võta kadunud hobuse juhtumit tõsiselt ja nii ei jää lastel muud üle kui uurimine enda kätte võtta. Lõpuks on loosse segatud nii pangaröövlid kui miljonid varastatud frankid. I didn't even know that this book had been re-released (I've read this when I was a child, and I still have my old, battered copy with me!). It deserves it, because it's truly entertaining, and outstanding because it's not really about children going happily on a vacation and get involved in an unexpected adventure, or of unfortunate children under pressure who suddenly find that there's some Destiny waiting for them... anyway. The story is about some poor children living in a slum area, who don I didn't even know that this book had been re-released (I've read this when I was a child, and I still have my old, battered copy with me!). It deserves it, because it's truly entertaining, and outstanding because it's not really about children going happily on a vacation and get involved in an unexpected adventure, or of unfortunate children under pressure who suddenly find that there's some Destiny waiting for them... anyway. Small gang of poor, suburb, post WWII children are getting back their toy horse, which was mysteriously stolen by some suspiciois adults. The book is very wordy, excessive in details, not entirely thought out in the way story progresses. Another obvious flaw is that the children characters are somewhat cheesy: all of them are only brave or funny and thoughtfull and nothing else. Also me and Sonya knew what will happen with the horse from the beggining, it was obvious. But still, the book had some Small gang of poor, suburb, post WWII children are getting back their toy horse, which was mysteriously stolen by some suspiciois adults. The book is very wordy, excessive in details, not entirely thought out in the way story progresses. Another obvious flaw is that the children characters are somewhat cheesy: all of them are only brave or funny and thoughtfull and nothing else. Also me and Sonya knew what will happen with the horse from the beggining, it was obvious. But still, the book had some good moments and it has this atmosphere of post-war. collapsed world where children still trying to squeeze some fun out of nothing. I read this a few times as a child. The kids would be allowed to roam the streets of Paris in a gang, all hours of day and night, they would regularly break into a warehouse where all kinds of stuff was piled up that nobody seemed to come back for, and every dog in the city came when one girl whistled. But it was an adventure and we were short of books. I am sure it recreated the times well. The title refers to an awful lot of money that was piled up in the warehouse, just like everything else. Th I read this a few times as a child. The kids would be allowed to roam the streets of Paris in a gang, all hours of day and night, they would regularly break into a warehouse where all kinds of stuff was piled up that nobody seemed to come back for, and every dog in the city came when one girl whistled. The title refers to an awful lot of money that was piled up in the warehouse, just like everything else. The kids thought it must be play money mustn't it? If you have a child who isn't completely hooked on typical American stories, he or she just might enjoy 'meeting' this gang of French kids. Sorti de ça... Il devait pourtant y avoir un peu plus pour que j'en ai gardé un bon souvenir. A group of French kiddos are given a broken-down toy horse that fast becomes they're favorite pastime. But it links them to a group of robber and makes life much more interesting for them than they'd bargained for. On the vintage children's books scale, this one leans more toward dated than charming, I'm afraid. I first read this book (in translation) when I was very very small, and continued to re-read it throughout my childhood - having bought a copy recently in a fit of nostalgia, it more than stands the test of time. Also Marion continues to be awesome. Such a great book, I've read it I dunno how many times. It's a terrific mystery set in post WW II France, and the plot rockets right along, but it's also about how love beautifies everything. Highly recommended. I read this in the English translation called "The Horse without a Head". I loved the tale of the French children outwitting a gang of robbers, and the description of their lives. One of my faves as a middle reader! A particular favourite of mine, as much for Richard Kennedy's delicate illustrations (in the English edition) as for the story. This book reminded me in passing of Postern of Fate, the very first Christie mystery I ever read. Great upper elementary kids book - and I think there is a Wonderful World of Disney show to go with it. Solid? This book didn't really leave an impact on me. I really enjoyed this, though it was quite a challenge for my French! It reminded me of some of the child-centred Spanish comedies of the 1960s and 70s without the sentimental schlock-- but these are poor kids in the railyards of postwar France, not well-to-do Spanish darlings who "just happen" to form a singing group in their spare time. Reading it, I thought it would make an excellent film, and I guess Disney UK got the same idea in about 1963, though I never heard of or saw the movie. Gaby is I really enjoyed this, though it was quite a challenge for my French! It reminded me of some of the child-centred Spanish comedies of the 1960s and 70s without the sentimental schlock-- but these are poor kids in the railyards of postwar France, not well-to-do Spanish darlings who "just happen" to form a singing group in their spare time. Reading it, I thought it would make an excellent film, and I guess Disney UK got the same idea in about 1963, though I never heard of or saw the movie. Gaby is the head of his "gang" of 10 friends, from age 11 down to little Bonbon who must be five or six. Gaby says that after age 12 a kid isn't a kid anymore, they get stupid and are "no good" for fun and games (an idea I ran across decades ago in one of Ray Bradbury's short stories). In those days, of course, many poor children had to start earning at least a crust or two of their daily bread at that age--and many joined the fulltime adult workforce by 14, so the idea holds water. The kids have only one toy, a three-wheeled papier mache horse that somehow lost both head and tail before it got to them, along with its pedals and drive chain. The "horse" was given as it was to one of the kids as a Christmas present, and they all think it's the greatest thing ever. Who cares that it can only roll downhill and has to be pushed or carried back up? The best fun they know is doing "suicide runs" down their narrow winding street, seeing who can fly the farthest when they fall off. But along come some grownups and steal their horse, for reasons the kids can't imagine. All they want is to get it back, and the chase is on! I like the fact that the girls are active members of the gang, not just cheerers and lookers-on. Marion in particular spends her time rescuing and tending to hurt and abandoned dogs, and they in turn are devoted to her, no matter who takes them in as pets. They come at her call and obey her in silence, like a band of guardian angels. The other kids, even the oldest boys, listen when she says "No" and do as she suggests without a murmur, because they know she's smart. Paul Berna, est le pseudonyme le plus connu de Jean-Marie-Edmond Sabran (21 février 1908, Hyères - 19 janvier 1994, Paris), écrivain français du XXe siècle.